Henry's Fork Anglers Cart (0) (208) 558-7525 Fly Shop Hours: Hours change seasonally. Please call ahead. Chris is the youngest son of Mike and Sheralee Lawson. He was born in Saint Anthony, Idaho but was raised at the HFA fly shop…literally! He spent two years serving a full time mission for the LDS Church in the Houston, Texas area, and graduated from BYU-Idaho with a degree in Recreation Leadership and Business Management. Chris is also an accomplished waterfowl, upland bird, and turkey hunter as well as an archery hunting fanatic. He has been practicing taxidermy since 2007 and specializes in upland game birds and waterfowl. Chris spent six years as an accomplished full time guide for Henry’s Fork Anglers. Chris was promoted to be the Manager of Henry’s Fork Anglers in 2010. He is no longer a full time guide, but runs the occasional overflow trip. 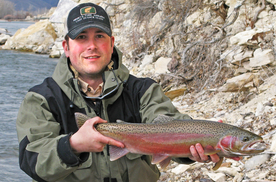 Chris’ responsibility now lies in assisting and directing Henry’s Fork Anglers. He holds an outfitters license in Idaho and Montana with special use permits on three National Forests, Bureau of Land Management, Yellowstone Park, and Harriman State Park. Chris has the direct responsibility with the guiding operation as well as the retail shop. Chris lives in Saint Anthony with his wife Jessica, and their three daughters Ruby, Livia, and Daphne as well as his two English Springer Spaniels, Bull and Lexi. 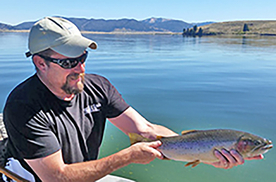 Todd was born and raised in Idaho to a hard working family of anglers. Some of his earliest memories were catching trout with his grandfather in and around the Cascade area of Idaho. He also enjoyed tagging along with his father on the Middle Fork of the Boise River. With his family background he was forever hooked on fly fishing. From an early age he knew there were two things he wanted to do; follow in his granddad’s footsteps and be a United States Marine and then become a fly fishing guide. From 1991 to 1995 he held the title of United States Marine and, after being honorably discharged in 1996, he moved to Ketchum Idaho and went to work for Headwaters Fly Fishing in Ketchum Idaho. Later he moved to Idaho Falls where he worked for a local outfitter and later he managed the fishing department at Sportsman’s Warehouse. When Shaun Lawson was the manager/outfitter at South Fork Outfitters he hired Todd as his assistant manager. 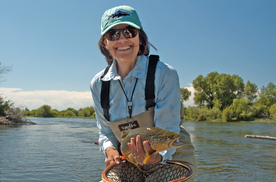 Todd moved on after Shaun relocated to Bozeman as a Program Director for Yellow Dog Fly Fishing. Mike is a noted author, fly tier, and lecturer. His book, Spring Creeks, has already become a classic. His newest book, Fly Fishing Guide to the Henry’s Fork, is a must have for anyone planning to fish these storied waters. He is also featured in several DVDs including the Henry’s Fork and South Fork of the Snake. Mike is a strong supporter of the conservation effort to protect our resources. He is a founding member and life member of the Henry’s Fork Foundation and a founder of the Upper Snake River Fly Fishers. 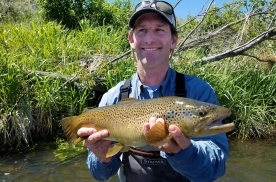 He is a member of the Madison River Foundation and a life member of the Federation of Fly Fishers and Trout Unlimited. 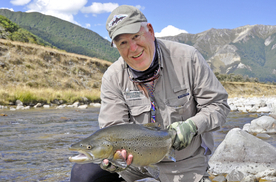 He has always strived to be the best outfitter in the fly fishing business. He remains committed to the owner, management, shop staff, guides and especially the customers and guests. His ultimate objective is for the total experience of every individual to meet or exceed their expectations. Mike has traveled to many of the greatest fly fishing destinations throughout the world and he continues to explore new opportunities. Most of his exploits occur during the winter months when fishing days in Idaho are limited. The great fly fishing he has experienced throughout the world only serves to reinforce his conviction that the best is right in his own backyard. His heart will always be with the home waters he has loved and enjoyed all of his life. Sheralee’s history with Henry’s Fork Anglers goes back to its beginnings in 1976. She has traveled with Mike all around the world to the various fly fishing destinations, however her favorite place is right here in Idaho. If it wasn’t for her hard work, Henry’s Fork Anglers would probably have crashed long ago. She is the merchandising master. Sheralee has an eye for the fly shop and gets our products into the customer’s’ hands. When she comes into the shop our staff stands alert. She makes sure everyone is working hard. She knows where the business needs to go, and we enjoy having her as part of our management team. Mark grew up in a family dedicated to conservation. His Grandfather, John D. Rockefeller, Jr. first came to Jackson Hole with his three oldest sons including Mark’s father, Nelson Rockefeller, in 1924 and returned in 1926. Because of those two trips Mr. Rockefeller resolved to help preserve the threatened valley, resulting in the creation of Teton National Park. Over the last 20 plus years, Mark has made his own impact on the area by helping to protect over 5 miles of critical and threatened habitat along the canyon of the South Fork, restoring and redeveloping the South Fork Lodge, and working closely with Mike Lawson to help build upon the already established legacy of Henry’s Fork Anglers. Together, Mark and Mike are committed to making sure Henry’s Fork Anglers always remains the finest fly shop anywhere, serving and supporting its customers and surrounding resources with energy, integrity, enthusiasm, and professionalism. In addition, Mark’s passion and commitment to conservation has led him to work with or support numerous high impact and world class conservation organizations including the National Fish and Wildlife Foundation, Henry’s Fork Foundation, Trout Unlimited, Teton Regional Land Trust, The Conservation Fund, The Nature Conservancy, World Wildlife Fund, National Wildlife Refuge Association, and the National Parks Foundation.